A number of the Civil War blogs listed in the lower right column covered the interesting discovery of what appear to be glimpses of Abraham Lincoln amidst the crowd in some 1863 Gettysburg photos. Here's one newspaper report of the story (USA Today) with close-ups of the new views, along with the more familiar head shot sifted out of the crowd in 1952. Another Lincoln photo caught my eye around the same time while browsing the blogosphere (it wasn't a current news item, and is nothing new to people who study such things). Doctored photos have been around as long as photography has been around, and certainly the Civil War era was fair game for pre-Photoshop photographers looking to spice up or repair a shot. Apart from staged photos (see William Frassanito's expositions on the movement of corpses at Devil's Den, for example), there is the case of Lincoln's head on Calhoun's body (see here), and some housekeeping with group photos (see here for the complete before and after shots of Sherman's generals, with and without Francis Blair). To see a parade of digital manipulations from the Civil War era to more modern shenanigans, have a look at this photo essay, "Digital Tampering in the Media, Politics and Law," which includes brief explanations of the two snippets above (click on the images there to see side-by-side comparisons). All of those pages are from the website of Hany Farid, Professor of Computer Science at Dartmouth, who has an big time interest in digital forensics. 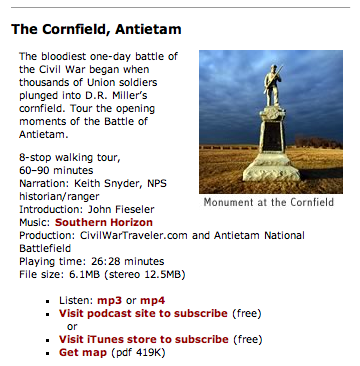 Another neat idea, this one made available free from the folks at Civil War Traveler magazine: podcasts of walking tours, recorded on the battlefield, narrated by National Park Service historians—with accompanying pdf maps you can print out. Ahhh, sweet, sweet technology. First, there was the world premiere of the opera Appomattox in San Francisco (see my review here). Now, as if to poke a finger in the other eye of conservative, California-phobic Civil War buffs, the musical "Atlanta" is opening in Los Angeles. 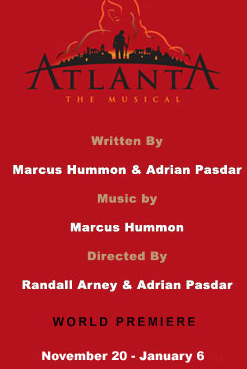 Playbill offers these particulars: "Grammy Award-winning Nashville songwriter Hummon—who has penned hits for Dixie Chicks, Rascal Flatts, Wynonna, Tim McGraw and more—teams with actor, writer and director Pasdar ('Heroes,' 'Desperate Housewives') on the musical, which mixes select prose by William Shakespeare with original bluegrass music and country tunes. Hummon provides the music and co-wrote the book with Pasdar. Set 'toward the end of the Civil War, in the waning days of the Confederacy,' reads a show description, 'a young Yankee, Paul, assumes the persona of a Confederate soldier in order to keep alive behind enemy lines.'" Shakespeare. Desperate Housewives. Bluegrass. Sounds pretty damn good to me. In all seriousness, the centrality of American roots music to this production, and the subject matter, cause me to reconsider my (opera review) vow that the only current musical I would consider attending is Spamalot. I'm not expecting something so transcendent as Jack White singing "Wayfaring Stranger" on the Cold Mountain soundtrack, or the haunting renditions of "Man of Constant Sorrow" from Oh Brother Where Art Thou, but maybe something along those lines. Go to the Geffen Playhouse site, and click on the "Preview Atlanta Here" box for sense of what they're trying to deliver. Somehow, even with a life-long near-obsession with cemeteries, and as an earlier subscriber to the on-again off-again Grave Matters newsletter, I came to be in my late 40s without ever hearing anything about "gravehouses"in the style of these structures in Eastern Kentucky. Check out the photos at this site. I am utterly fascinated by this. Out of curiosity, I have queried the photographer about the Union soldier he references in the text. Click on the "Project Home Page" link, and have a look at the whole site, entitled, "Sickness and Death in the Old South." Readers of the last blog entry here may have noted that the controversy over the Alacatraz photographs really took off in early August of 1864, and that by August 5th, Department of the Pacific commander Irvin McDowell was assuring the War Department that the situation was under control (the prints and negatives seized, and the customers' names obtained). In subsequent correspondence, he was compelled to defend the honor of Capt. Winder, whose loyalty had been called into question. Little did McDowell know, mid-August of that year also brought an informal performance review of his own position, though not for issues related to loyalty. McDowell's record in Virginia in the early years of the war was indelibly stamped with the defeat at First Bull Run, one of many connected topics intriguingly explored at fellow blogger Harry Smeltzer's Bull Runnings site. Ouch. "Unofficially," Grant says, McDowell is a disaster waiting to happen. He is not a good military commander, nor is he suited to deal with civilian authorities. He will do more harm than good. 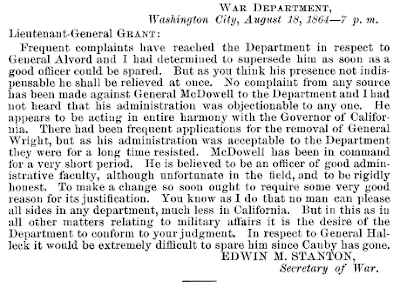 I'm struck by the seemingly casual tone of Grant's recommendation that McDowell be summarily dismissed or demoted from department command. The Secretary of War, to his credit, replies with a solid defense of General McDowell. Nicely done. Stanton lays it all out: 1) there have been no complaints about him (unlike his predecessor), 2) he works well with the governor, 3) he's a good administrator, and 4) he's scrupulously honest. Yet he defers to Grant on the matter. At last, to Grant's credit, he backs off the recommendation, reiterating that his poor impressions were based on unofficial sources— indeed, based only on something he'd heard [from one or more McDowell detractors]. Good thing, too. From all I can learn, McDowell was an able department head, was a well liked and effective administrator, and the civilian authorities Grant was concerned about were well pleased with his service. 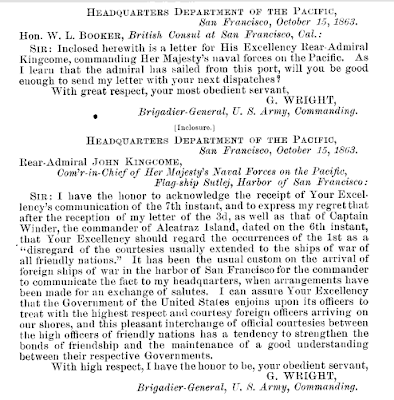 His post-war army career took him around the country, but he returned to the West Coast to command the Division of the Pacific before his retirement in 1882. He is regarded highly in San Francisco, where his service as a park commissioner was instrumental in the development of Golden Gate Park, one of the nation's great urban green spaces (photo below: Google Maps). 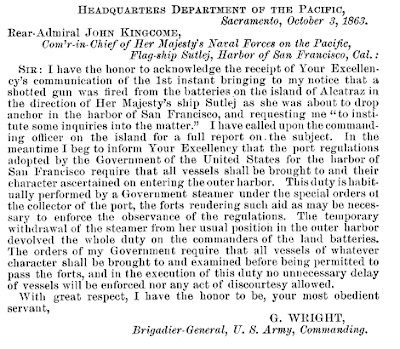 Just a quick follow-up to my last blog entry, in which I mentioned how Captain William A. Winder, commanding the Civil War-era garrison on Alcatraz island in San Francisco Bay, raised hackles among our British allies by firing a shot across the bow of their Pacific fleet flagship. That incident blew over with an exchange of brusque communiques, and the rest of Winder's Alcatraz command remained uneventful, until 1864, when he got a hankering to document his island fortress in a series of detailed photographs. 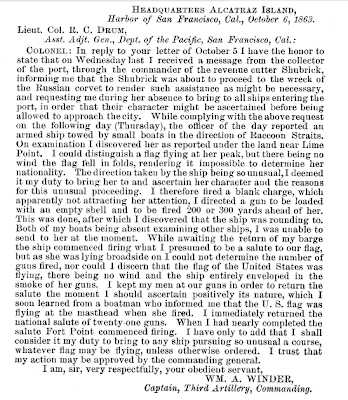 The San Francisco outfit of Bradley and Rulofson was chosen for the task, and they set about exposing two thousand negatives of the island defenses from, presumably, innumerable angles. When a member of Corps of Engineers, Lieutenant Elliot—eager to show his superiors the progress made at Alcatraz—forwarded some sample photos to Washington, congratulations were not forthcoming. 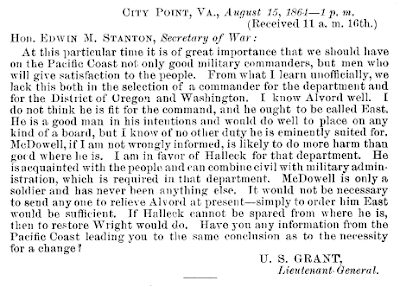 Upon receiving Elliot’s letter on August 1, Chief of Engineers Delafield immediately fired off a telegram informing the lieutenant in blunt language that all such photographs were to be “instantly suppressed.” That same day the Chief of Staff of the Army, Gen. Henry Halleck, sent off his own wire, containing a frightening directive: Secretary of War Edwin Stanton had personally ordered the photographs seized. Things moved quickly. Three days later the San Francisco Evening Bulletin ran a story under the headline FORT ALCATRAZ TAKEN!, which reported that at 4:00 P.M. on August 2 a party of armed soldiers had arrived at the Montgomery Street studios of Bradley and Rulofson. Brandishing orders from the War Department, the soldiers had seized all the photographs, negatives, and correspondence relating to the Alcatraz contract, including the name and address of every customer who had ordered a copy set. That nearly did it for Captain Winder. He was the grandson of a prominent American general in the War of 1812, and the son of a distinguished Mexican War veteran. But that all changed in 1861. 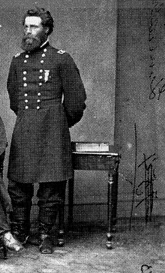 The fact that his father, John H. Winder, had resigned his U.S. commission, ultimately becoming a Major General in the Confederate army in charge of all POW camps east of the Mississippi—and a pariah in the northern press—cast a dark cloud over the loyalties of the young captain. It didn't help that Captain Winder was now distributing detailed photos of the lynchpin in the San Francisco Bay defenses. Must have seemed like a good idea at the time. 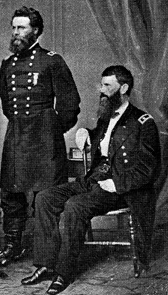 Irvin McDowell, then commanding the department, defended Captain Winder, assuring Washington that the young officer was motivated by pride in his command, rather than in any effort to aid the enemy. 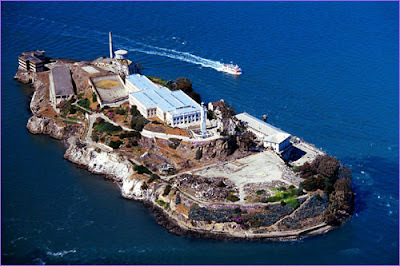 Still, a humiliated Winder resigned his command at Alcatraz and transferred to the sleepy post at San Jose, at the south end of San Francisco Bay. Most interesting is the saga of the photos themselves. They were thought to have been destroyed upon Stanton's orders. Only by chance did John Martini, author of Fortress Alcatraz and the aforementioned American Heritage article, discover one image mistakenly identified as Ft. Point. 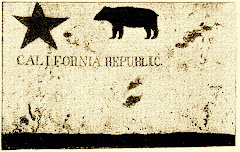 Through a fortunate series of events, this led to the discovery of eight other images in the series, all mislabeled and hidden away in Sacramento for over 100 years. The lost Alcatraz photographs can be seen in Fortress Alcatraz, but it's difficult to find any of the photos online. They also appeared in the November 1992 issue of American Heritage, but only the text of the article appears online—here. Read the AH piece for the fascinating story of how Martini identified the photos—a tale that warms the cockles of history buffs' hearts. Archives everywhere are full of such undiscovered treasure, or so I want to believe. Page 48 of the Google Books version also has a sidebar summary of Mr. Martini's happy sleuthing. Reading the Official Records of the War of the Rebellion, even at random, never fails to produce something of interest. 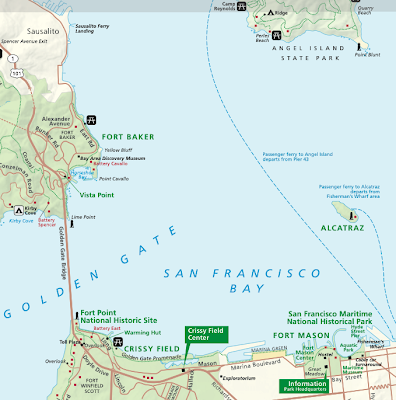 Continuing the last entry's focus on Left Coast (Civil War-era) fortifications, I want to put up at least two short pieces on San Francisco's Bay's most famous island, if not its most spectacular (saving Angel Island for still another entry). You know the one—what the Spanish named Isla de Alcatraces, or Pelican Island. Later just called Alcatraz. Or for you criminal types, The Rock. 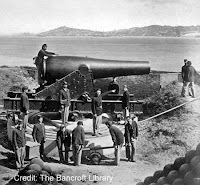 Alcatraz was the centerpiece of harbor defenses, able to reach anything coming or going with her massive guns. For most of the Civil War period, the installation was commanded by William A. Winder, the son of a Confederate general. Sons of rebellious fathers are always looked upon with suspicion, never more so than during wartime. Winder served his country with honor, but nevertheless brought unwanted attention down upon his far-flung post. 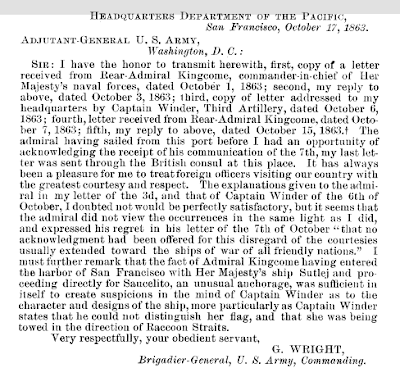 Here is some correspondence from the Official Records about the time the Commander-in-Chief of Britain's Pacific Fleet came calling, and, as he saw it, was rudely fired upon by Captain Winder. 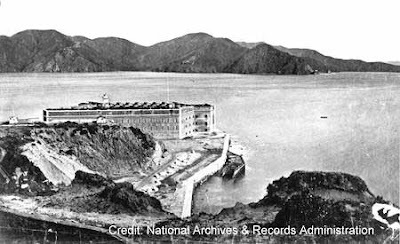 Tomorrow, or tonight, look for another Alcatraz entry on how Captain Winder's loyalty subsequently came under question all the way back in Washington. 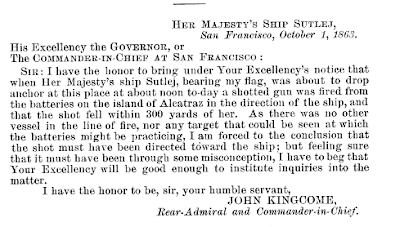 To summarize the following (click on individual telegrams for a slightly more readable view), Rear-Admiral Kingcome, making a courtesy visit, moved into San Francisco Bay with his flagship Sutlej. The day was so calm, his colors could not be discerned, and Winder fired a shot to bring to the unidentified ship. 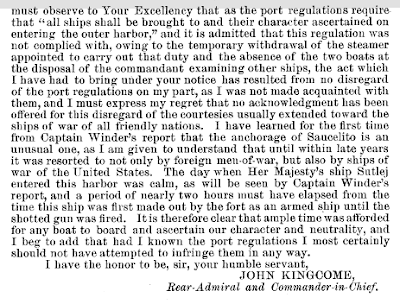 Kingcome took umbrage and wrote Winder's boss, George Wright. Winder gave his side of the story, but Kingcome wasn't entirely satisfied. A couple years later, the son of the Confederate general would have bigger problems (next entry). Some of the greatest preservation "victories" were not even contested, but instead depended on something as tenuous as one man's opinion. Fort Point, in San Francisco's Presidio, was one of the 1850-1884 "Third System" harbor fortifications that included such well known Civil War-related structures as Monroe, Morgan, Jackson, Pulaski, Pickens, and Sumter. Fort Point was finished in 1861, and was the first tier of San Francisco Bay defenses covering the Golden Gate. As Emanuel Lewis wrote in Sea Coast Fortifications, "from the technical standpoint, this large group of massive, vertical-walled forts represented the general embodiment and the fullest development of features which had previously appeared in only a few and isolated instances, i.e., structural durability, a high concentration of armament, and enormous overall firepower." Fort Point today is one of San Francisco's historic treasures, but it might easily have been demolished to make way for the Golden Gate Bridge in the 1930s. Interestingly, the principal resistance to destroying the fort, in the future-looking world of 1937, came from the builder. Thank goodness for Joseph Strauss (look for his statue on the south overlook next time you visit the bridge). Chief Engineer Joseph Strauss initially concluded that Fort Point sat on the optimal location for a huge concrete caisson anchoring the bridge’s San Francisco end. After touring the empty fort, however, he changed his mind. In a 1937 memorandum to the bridge’s Board of Directors, Strauss wrote: “While the old fort has no military value now, it remains nevertheless a fine example of the mason’s art. Many urged the razing of this venerable structure to make way for modern progress. In the writer’s view it should be preserved and restored as a national monument…” Strauss made some additional calculations and concluded that the fort could be spared by moving the southern anchorage several hundred feet south. However, in order to make up the difference in the total length, he would have to add a ‘bridge within the bridge,’ and consequently designed a steel arch in the southern anchorage to span the old fort. Fort Point would be overshadowed by the new bridge, but it would be preserved. The bridge itself is a wonder to behold, but I always find myself looking for that little arch on the south end—the bridge within a bridge—that serves no other purpose than to protect an old pile of bricks. Thank you, Mr. Strauss. As it turns out, the top deck of that fort offers one of the most amazing views of the bridge, and Strauss probably thought of that too. About one year ago, in my October 30, 2006 blog entry I made passing mention of some Civil War-related "Roadside Attractions"
inlcuding a reenactment of what is claimed to be the Civil War's first amputation in Philippi, West Virginia (scroll down at that link to read about the unfortunate surgery). Philippi also boasts the Mummies of the Insane exhibit, which I'm guessing draws more visitors. There's much more to the amputation, story, however. I chanced upon one of many news reports about American service personnel in Iraq who have been fitted with the latest in prosthetic devices. I don't recall where I read it now, but the article made mention of the Civil War amputation in Philippi, which caused me to dig a little deeper. 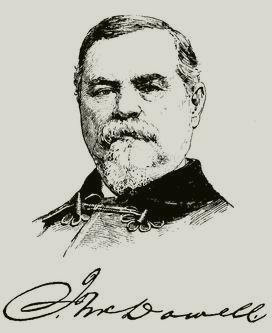 Turns out that first patient, James Edward Hanger—a Confederate cavalryman wounded in the Battle of Philippi—later designed his own artificial leg [editor's note: see the comment below from Steve M., who says that Hanger did not enlist on either side, but wanted to join Union forces initially). Perhaps this story is more widely known than I realized, but it was the first I'd read of Mr. Hanger (pictured at top) in any detail. 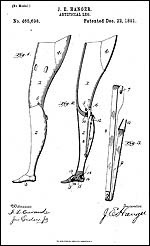 According to a company history of the Hanger Orthopedic Group, young Hanger "designed an artificial leg with the first hinged knee and hinged foot, forming it out of whittled barrel staves, rubber, wood, and metal components (the illustration at right is from Hanger's patent). According to a history of prosthetics from Northwestern University Medical School, Hanger 'replaced the catgut tendons of the American leg [an earlier prostheses named in 1856] with rubber bumpers to control dorsiflexion and plantarflexion and he used plug fit wood socket.'" Eventually, Hanger set up shop in Richmond producing limbs for other Civil War amputees. The company he started, and that still bears his name, has since supplied advanced prostheses to amputees of every American military conflict. Today, the company has over 3,500 employees and a presence in 45 states (here's a fascinating short history of "Orthopedics at War," by Danielle Cohen; the Hanger company timeline is at the company website, and also here). Hanger is not the only company that dates back in some form to the American Civil War. And the Hanger Limb was not the only innovative advance to spring from those years of slaughter, but I'd wager there are a lot more items on the killing and maiming side of that particular balance sheet. Take a moment this evening to raise your glass to James Edward Hanger, 1843-1919, considered by some to be the father of modern prosthetics. Where is the statue to Mrs. Arnold? Many a woman answered the call in the Civil War years, and devoted herself to taking care of wounded soldiers back from the front. In what would become the newly-minted Union state of West Virginia, one woman in particular, Laura Arnold, was well remembered by convalescing Union troops, one of whom wrote that "her fragile form was almost ubiquitous in the hospitals, and with her own tender hands she soothed the aching temples of many a dying soldier boy, far away from the loved ones at home." Colonel Moore of the 28th Ohio Infantry called Mrs. Arnold "the most loyal woman in West Virginia." Years later, in 1897, the assembled Society of the Army of West Virginia made her an honorary member for her "patriotism and past efforts on behalf of Union arms." After the turn of the century, in 1905, she was on hand for a reunion of the 5th West Virginia Cavalry, which had occupied Beverly, (West) Virginia following the 1861 Battle of Rich Mountain. The old veterans named her "Mother of the Regiment" for her efforts as nurse to their injured. When Laura learned in 1863 that her brother, "Stonewall" Jackson, had died, a Pennsylvania Cavalry officer recorded her reaction in a letter home. When she "heard of her brother's death," he wrote to his father, "she seemed much depressed, but said she would rather know that he was dead than to have him a leader in the rebel army." Laura and Thomas Jonathan Jackson remained close, even with the advent of war. Each named a child after the other. In an earlier blog entry, I highlighted some of the voluminous correspondence between these two siblings, some of which can be read online from the Virginia Military Institute archives. The VMI site also has a photo of Laura, here. THEY BATHE HORSES, DON'T THEY? Where is the statue or memorial to Mrs. Arnold? I hope faithful readers can point me to it. Her brother was particularly skilled at killing United States soldiers, while she did her best to save a few. Statues and memorials to Stonewall abound. His arm warrants its own grave, and his trusted mount is is still getting makeovers (albeit, only every 140 years or so). Most of what I know about Laura Jackson Arnold I gleaned from the VMI site, and Albert Castel's essay, "Arnold vs. Arnold: The Strange and Hitherto Untold Story of the Divorce of Stonewall Jackson's Sister" (appearing in Winning and Losing in the Civil War, Essays and Stories, University of South Carolina Press, 1996). It's a fascinating and somewhat sad story that might have come across as sordid or sensational in the hands of a less talented historian. But that's another story, for another night. Is there a lesson to be learned in this short entry? I can't think of one, unless it's that history loves a warrior more than it does the person who dresses the wounds the warrior inflicts— even if the two are related.